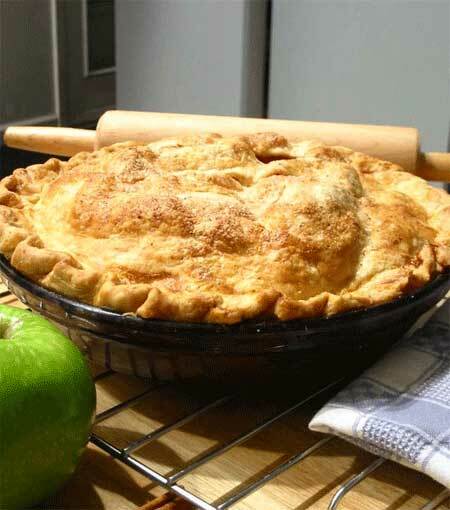 Apple Pie Recipe – just 4 Points! Good old American apple pie. Who doesn’t love it? Can you imagine a Thanksgiving Dinner without it? I certainly can’t. And since I’m a big apple pie fan, I was determined to find a tasty, low calorie apple recipe that would be low in Weight Watchers Points, but still delicious enough to impress my dinner guests. I hit the jackpot with this one! Part apple pie recipe, part apple cobbler recipe, this dessert is a must for fall parties and dinners. Only 4 Weight Watchers Points per slice! Woo hoo!! Preheat oven to 400ºF. Start by making the crust. First, in a large mixing bowl or a food processor, combine 2 teaspoons of sugar and 1 cup of flour. Add 3 tablespoons of chilled, reduced calorie margarine and process until mixture looks crumbly, like coarse meal. If you don’t have a food processor, just use your fingers. Then start to mix in cold water, one tablespoon at a time, and mix well forming a dough. Using a rolling pin, flatten dough in a circle a bit larger than a9-inch pie pan. Press dough into the bottom and up the sides of the pie pan. Next, make the filling. To do this, combine 1/4 cup of sugar, apples, cinnamon and cornstarch in a large bowl; add in the apple slices and toss to coat. Place mixture in prepared piecrust. Finally, make the topping by mixing 2 tablespoons of sugar, melted margarine, 5 tablespoons of flour, 2 tablespoons of sugar and oats in a small bowl; scatter over apples. Bake for about 45 to 50 minutes or until crumbly topping is golden brown in color and apples are tender. Cool for at least a half hour before serving. Serves 8. Which points system? 4 points for old program or new points plus program? Thanks. This is an old recipe based on the old Points system, not the new Points Plus. this pie dough turned out more like a thin layer of chewy bread… not good at all. Use splenda and make it even healthier! This picture does not depict the pie as the instructions defined it. There is no way that the crust described could look like the crust in the picture. Thankyou for a notable Blog about how to prepare Apple Pie. This is a distinctive recipe about how to cook Apple Pie.